How is our Hypnobabies Childbirth Class different from other “hypno-birthing” programs? We are often asked what the difference is between Hypnobabies and other natural childbirth or birth hypnosis programs. Other natural childbirth courses have excellent programs and benefits that have helped many women have better, more relaxed births. We recognize that and celebrate them and what they do every day for birthing women! In Hypnobabies, our objectives are to teach an expectant mother how to stay healthy and low-risk, to be an excellent consumer, to trust in her body, her mind and her baby, as well as to become self-reliant and confident about birthing her own way: safely and in comfort. In addition, we aim to help our pregnant couples bond with their baby in utero. We overcome negative belief systems and programming, get you in touch with your own beautiful pregnant body, support you through your own excellent birth experience and give you skills that you will use for the rest of your life. Birth Partners are brought into the preparation process and have their own hypnotic relaxation cues, as well as a special role to play as they await the birth of the precious newborn with our Hypno-Mom. We use real, medical-grade, somnambulistic hypnosis techniques, addressing the mind, body, and spirit of both mother and baby, so our success and satisfaction rates are wonderful and very gratifying. Our goal is helping families to “enjoy your baby’s birth in comfort, joy and love”! What else makes Hypnobabies stand out from the others? We are not a typical birth hypnosis class. Hypnobabies is very detailed, comprehensive and successful, uses medical hypnotic anesthesia techniques, from Gerald Kein’s powerful Painless Childbirth program, as opposed to simple visualization and imagery. Hypnobabies contains the same kinds of powerful somnambulistic hypnosis scripts used by people who undergo surgery successfully using hypnosis as their only anesthetic – people that are allergic to medical anesthesia and use *only* Hypno-anesthesia techniques during surgery – the same one used in Hypnobabies! Long before they ever step foot in their first Hypnobabies class, our Hypno-moms receive their first 2 hypnosis audio tracks: Your Special Place, which allows them to learn and become proficient in deep physical relaxation, and Easy, Comfortable Childbirth, enabling them to easily master deep hypnosis and positive birth training. Each Hypno-mom is then able to create deep physical relaxation and practice their hypnosis skills for several weeks (or months!) before Hypnobabies Class even starts. This makes it much easier to learn her Hypnobabies Hypno-anesthesia techniques in each class, bringing the Birth Partner into the preparation, (if they have one) and also how to use hypnosis for many other issues: nausea elimination, back and hip pain, insomnia, pre-term labor, pre-term bleeding, perineal massage, internal exams, turning a breech, etc. Sixteen powerful, deep hypnosis audio tracks for use by our Hypno-Mothers as they learn, practice and use their Hypnobabies program as well as 2 45 minute-long Affirmations tracks. We also include 1 hypnosis track for our Birth Partners so that they easily become calm and relaxed about pregnancy and childbirth. Since the background music in all of our Hypnobabies hypnosis audio tracks becomes a part of the hypnotic induction process, it contains “binaural beats”. This process allows the brain waves to synchronize (brain wave entrainment) which provides our Hypno-mom and Birth Partners to enter hypnosis faster and attain a deeper state of hypnosis called “somnambulism”, where Hypno-anesthesia is more easily created and accessed. This is a very important unique feature of Hypnobabies since our expectant and birthing Hypnobabies moms can enter hypnosis instantly and become physically comfortable and emotionally confident as soon as the music begins! Two separate hypnosis cues for entering hypnosis quickly and deeply, and 7 hypnotic deepening techniques. These are important since each Hypno-mother’s needs are unique during labor, and since she has learned and practiced these cues many times, she can choose which ones are most effective for her as she gives birth to her baby. Five somnambulistic hypnosis scripts in booklet form, for use by our Hypno-Couples to work with as a team. Our Hypnobabies students participate in one new hypnosis script each week in class and their hypnosis scripts booklet provides them with that same script to work with for reinforcement during the next week. This makes a huge difference when training the inner mind for success of any kind. It is called “compounding” in the world of hypnosis and is necessary for hypnotic suggestions to be retained by the woman’s subconscious. Working on progressively more powerful scripts several times week together also allows our moms to become “hypno-trained” to the touch and voice of their birth partner and therefore respond much more easily and quickly to birthing cues during labor. We provide detailed, comprehensive training for our Birth Partners by providing them their own Birth Partner’s hypnosis recording for a calm and confident attitude towards pregnancy and childbirth, and their own detailed Birth Partner’s Guide booklet for labor, which allows them to fully learn and feel confident about their role in the preparation for baby’s birth as well as easily supporting the Hypno-Mom during birthing. This includes 4 pages of verbal birthing cues which keep the Hypno-Mom in hypnosis during first stage, transition, beginning to push, the pushing phase as well as tools for remaining calm, relaxed, confident and comfortable in between contractions. Hypnobabies can also be very successfully used by Single Mothers or those whose partners will not be participating in their birth preparation process since we have specific information and well as personal help and support for single Hypno-moms, to make their Hypnobabies journey easier and more fulfilling. All of our Hypno-anesthesia techniques can be easily learned, practiced and used alone, or with a Birth Partner or doula. Hypnobabies classes also provide excellent and Complete Childbirth Education, and we are the only birth hypnosis program that does so (see information below, and our Class Outline). Providing our *Complete Childbirth Education* ensures that our Hypnobabies students will not need to take other childbirth education classes where techniques and philosophies are learned which can negate childbirth hypnosis instruction. “Pain management and coping skills” are actually opposite of what is learned in Hypnobabies; we teach Pain Elimination by using real Hypno-anesthesia. We have found that attempting to embrace opposing childbirth methods (which create specific belief systems) can be detrimental to success with hypnotic childbirth. Including Complete Childbirth Education is essential for *any* birth hypnosis program. “Eyes Open Childbirth Hypnosis”, which allows each Hypno-mom to walk and talk and move around freely yet remain deeply in hypnosis, very relaxed, fully present, aware and in touch with her body and baby and *comfortable while doing so*. 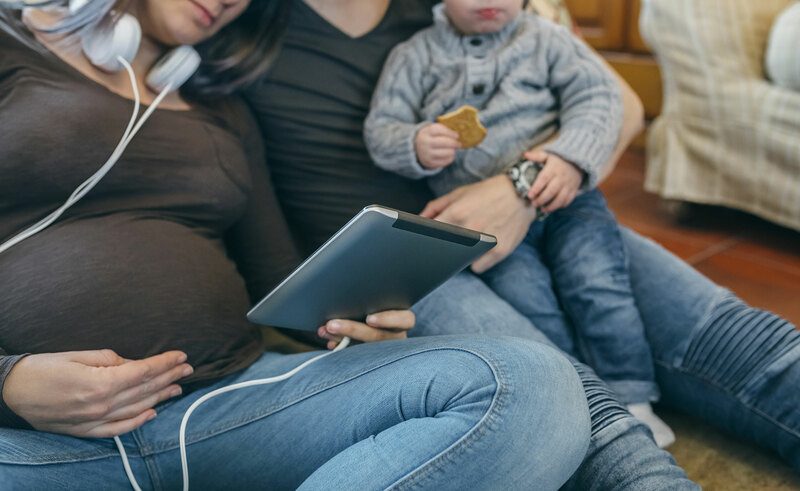 Other programs rely on immobility for focus and concentration, which can severely impede the progress of labor and the descent and positioning of the baby. We conduct full Birthing Rehearsals in class # 6 so that our Hypno-moms can experience using their actual Hypnobabies techniques and many different labor positions *while in hypnosis in class* which is invaluable, and also shows the Birth Partner hands-on exactly how to use his/her cues and assistance. What a confidence builder, and has made a huge difference in success rates here at Hypnobabies! Our very successful Hypnobabies Birth Visualization, in which you can mentally and emotionally *practice* entering labor, experience your comfortable birthing techniques and give birth easily and in a very detailed and personal way. This “mental birthing rehearsal” is very important to the process of easy and comfortable birthing and is done many times until your Hypno-baby is born, helping program your subconscious mind to produce exactly the kind of birthing you want. Athletes and public speakers of all kinds do this to prepare with great success, and so do our Hypno-moms! We require that our Certified Hypnobabies Instructors have a fully trained background in Childbirth and a minimum of 50 hours of Hypnosis training before becoming accepted into our Hypnobabies Instructor Training Program. This ensures that as a Hypnobabies Instructor, all childbirth questions and concerns from each Hypno-couple can be addressed, hypnotic depth can be assessed, and problems such as resistance and abreaction can easily be dealt with. We also require 32 hours of Hypnobabies Instructor Training and have a demanding and rigorous Instructor Certification process. Our Hypnobabies Instructors are always available for help before, during and after your Hypno-baby is born, and we also have a free online Hypnobabies Moms support forum attended by certified Hypnobabies Instructors for support and encouragement so that you can enjoy a community where others are using Hypnobabies as well. Hypnobabies includes 21 hours of classroom instruction instead of 8 or 10, and although other childbirth programs may contain some excellent hypno-tools for birthing, none contain the amount of information, in depth hypno-anesthesia, training, practice and support of Hypnobabies. All elements have been carefully designed to work together and the results are excellent.